There are actually four stock cars at 1880 Town near Murdo, SD. Three are NP and one is CB&Q. The Q car is No. 52144 and is displayed next to the depot with an ex-NP caboose. The only NP car number I have is 82710, which is the one displayed behind their ex-Great Western 0-4-0T. Two other NP cars are spotted at the stock chutes. Last edited by Jeff Terry on Sun Feb 05, 2012 2:52 pm, edited 1 time in total. Thanks for posting the photos of the 4 stock cars at Murdo. A quick search turned up a few that seem hidden away out of the public eye. I just noticed in your photo that the stencil for this Santa Fe stock car starts as 258 with Mr. LePrince blocking the rest of the number. Mr. Sandifer shows the car on his list as being 25480, which seems in error if the stencil is correct. Can you furnish the number that Orange Empire is putting on the car? Thanks. I just received a message from Mr. Levin showing a photo of this finished stock car and the AT&SF number is 25840. For those who might be interested in that sort of thing. Here's a link to two photos of Soo Line #29667 at Mid-Continent Railway Museum taken March 18, 2012. Installing roof walks is on our to-do list for this year. The paint job is about 6 years old (give or take) and needs some work. Like maybe a new paint job. I saw the recent photo special on the Texas State Railroad behind Magma Arizona 2-8-2 #7 which included a stock car in the consist. I remembered this thread and thought that perhaps that car was listed, but no. Couldn't find anything on the TSR website about it. Any ideas as to the cars heritage? Thanks. This old discussion made me aware of how rare standard gauge stock cars are in preservation. 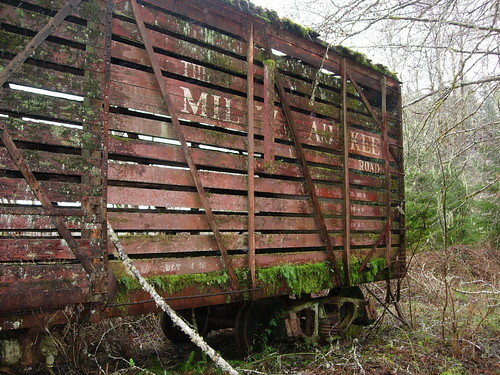 A lot of rural SP depots used to have stock pens including Niles and Sunol on the Niles Canyon Railway, but, as far as I know, no SP standard gauge stock cars are preserved. I just came across this listing for two SP stock car bodies in Tuscon, but they look to be in really rough shape. http://tucson.craigslist.org/atq/5178152672.html. Anyone out there insane or resourceful enough to take these on? I wouldn't take the price too seriously. Not many people pay the advertised prices on Craigslist. Les, You know that TSRR cars are often relettered for different roads, as requested for movie shoots and photo freight charters, or at least they were in my time. My records show the stock car as being a bona fide, original CB&Q car, no number given. Maybe somebody who lives closer to Rusk can look underneath or inside it, and find out for you. The ATSF stock car at Orange Empire has an identity problem from before it arrived at Perris. The car body carried number 25480. 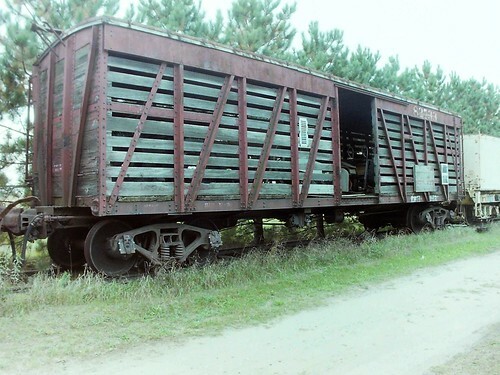 The underframe carried information stating the car number and the box car number it was rebuilt from. That stock car number was 25840. From information I received the box car number matched the paper records for the stock car number on the frame. Either of the numbers are among the number series for this group of stock cars. One thought is that at some time Santa Fe repainted the body and the painter mixed up the digits of the number. Or is the underframe information wrong? Thank you sir! At least you have told me that the car at the Texas State Railroad is from the Chicago, Burlington & Quincy, which I did not know until now. I'll keep my fingers crossed that someone might actually check around the car someday, to see if they can find the CB&Q road number. Hesston Steam Museum a few years ago. Very popular with the kids.